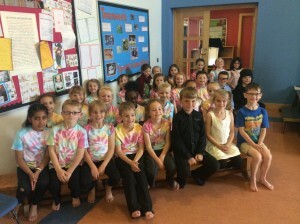 This week Year 2 pupils performed their End of Key Stage 1 Show ‘The Wizard of Kings’ Forest’ and it was an absolute success. We were amazing, managing to remember all of our lines and what we needed to do. 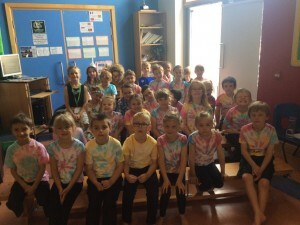 We have been creating tie dye t-shirts ready for the performance and they were fantastic! 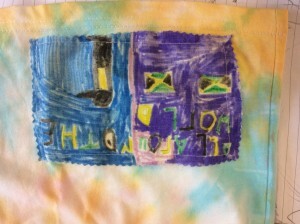 We designed our own patterns, as well as a personalised picture to sew onto the bottom showcasing our favourite topic from Year 2. See below for a super design for ‘All Around the World’. 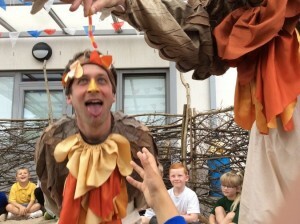 Recently, Y1 and Y2 pupils were delighted by a visit from a drama group performing to each class. 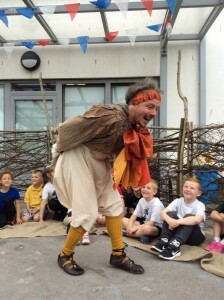 The performance, called ‘Flit, Flap & Fly’ started when our children found themselves in an unusual nest and they soon became involved in the daily life of a remarkable bird family. With no words spoken in English, every child was transported through gestures, actions, behaviour and song to narrate the birds’ story. 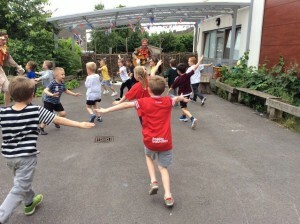 At the end, every child and adult couldn’t resist the urge to fly along with the newly flying baby bird. It was a huge adventure with the tiniest of creatures – amazing! The children were enraptured. “It was brilliant because they sang birdsong to each other.” – Flora. “I liked it because it was funny and they played peaceful music.” – Emily. 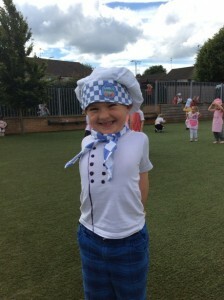 Last week, children in Reception and Y1 took part in a huge Infant Music Festival with other schools from the area. We learned and sang amazing songs about food. “I liked it when I had to play the spoons on my knee on the stage.” – Lily. “I liked it when they taught us a song about toast and marmalade.” – Evie. 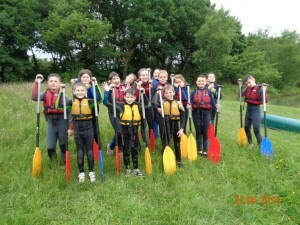 Year 6 had a most wonderful time on camp in Okehampton. 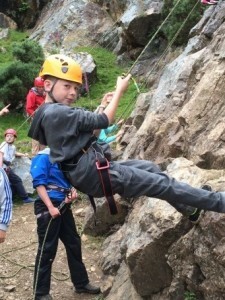 It was inspiring to see every child take part in every activity – everyone showed such determination to push themselves and rise to every challenge. 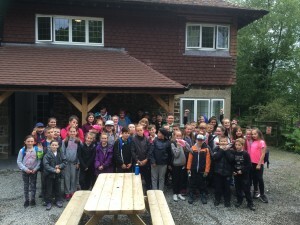 Day one – After a few hours on the coach, we arrived and got settled in to our lodgings. 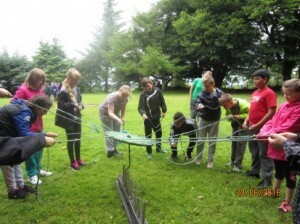 Then we split into two groups: one to go weaselling and the other to take part in teambuilding challenges. We came back together in the evening to enjoy a delicious dinner and watch the second half of the England game! Day two – The day began with a huge breakfast to provide enough energy for the hectic day ahead. 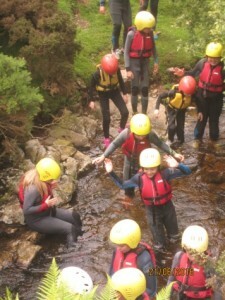 Our first activity was a 5 mile cycle, followed by gorge scrambling (walking upstream through a fast-flowing river) and rock climbing. 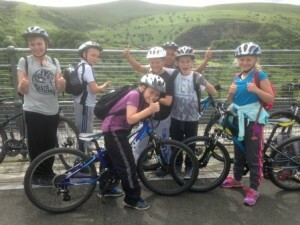 Then our aching limbs had to propel us home once more on our bikes. 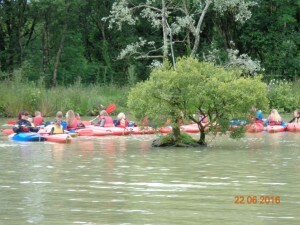 Day three – Wednesday was spent at the lake, taking part in kayaking, canoeing and raft-building. 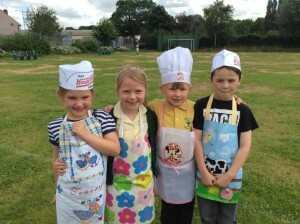 All three activities were dominated by laughter and splashes, with every single person ending up drenched but smiling! In the evening, we took a trip to Okehampton castle and learned a spooky tale about Lady Howard…. 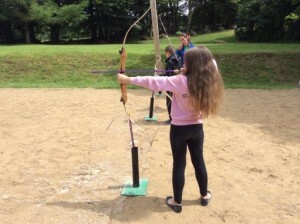 Day four – Our three activities on our last full day were high ropes, bush craft and archery. 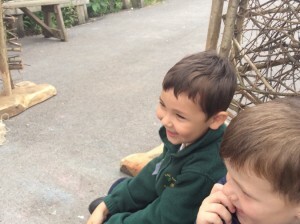 There were many superb dens built, climbing obstacles conquered and balloons burst with sharply-shot arrows! In the evening, we demonstrated our superb dance moves with the final boy/girl dance-off battle ending in a tie. 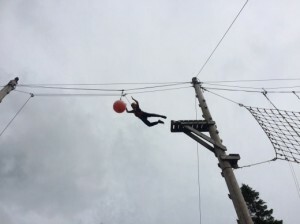 Day five – The final morning saw us hurriedly packing every damp and dirty item back into cases so that we could take part in our last activity which was either team-building or weaselling (whichever we hadn’t done on the first day). Then we waved goodbye to Bracken Tor and began our long journey home.